Well, Spring is here and once again has brought along her beautiful bounty of blossoms. Bubblegum pink tulips, mustard yellow daffodils, luscious lavender wisteria, and all those brilliant poppies splashed across the hills like a painter’s palette. The hummingbirds flit about like lovely little jewels, whizzing past your ears so fast, they sound like miniature helicopters zooming around at breakneck speed. Bzzz! Bzzz! The Central Valley’s abundant orchards are an explosion of color, as the fruit trees burst with fluttering petals. Plums, peaches, apples, and nectarines are all ripe for the picking this time of year, and the sprays of colorful blooms pop against the blue sky. This also holds true for Animal Rescue of Fresno, where Spring not only brings budding plants, but also the most perfect weather of the year. The ARF dogs are enjoying the warm sunshine, lounging on beds and toy-lined pools, or for the adventurous type, flat out on the ground. Because there’s nothing like a nice long roll in the dirt to really make you feel special. At least that’s what I’ve heard. 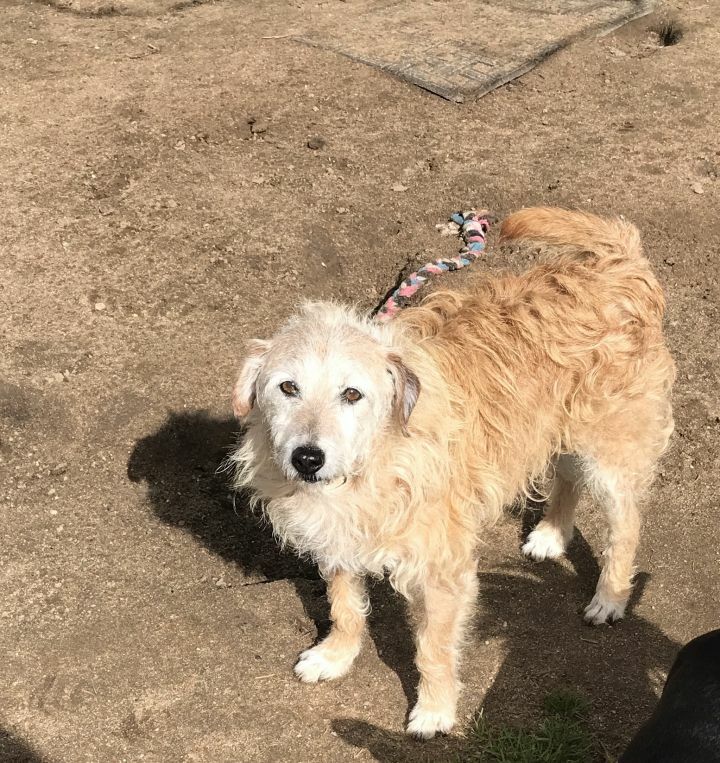 Shaking off their winter coats, and parading around the dry yards, the dogs see Spring as the season for new beginnings at ARF, and hopefully, new homes for all. Let's keep our fingers and toes crossed that Summer isn’t looming right around the corner, with its triple-digit temperatures, dry brown lawns, and sole-searing cement. When that happens, the ARF dogs will be digging holes in the shade, swimming in pools, and then rolling in the dirt. Muddy, dripping-wet dogs, shaking off twelve pounds of water; now that is so NOT special. There are certain dogs at ARF that I am positive will not be enjoying the sweltering Summer when it arrives. One of those would be Gentle Ben, a giant bear of a dog with a very fuzzy coat, and goofy disposition. 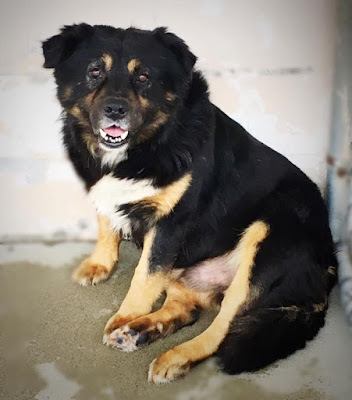 When he came to ARF via Animal Control, Ben completely shut down and showed no signs of a personality at all. This is common for dogs who have been moved from place to place, never having enough time to adjust before they are sent to another shelter. It’s sadly like the kids who are moved from foster home to foster home, and never given the chance to show how great they can be, and show their true colors. Ben has slowly come out of his shell, and has settled into life at ARF where he is definitely a fan favorite of the volunteers. Though he appears to be quite the “blob dog,” he loves playing with toys, while bowing and leaping around. Gentle Ben is the epitome of young at heart, as he gets along with all ages of other dogs he’s been around. Our best guess at his breed is a Chow Chow/Rottweiler mix, and he’s a pretty good-sized boy. If you’re looking for someone to occupy the other side of your couch on movie night, Ben would definitely be a good fit. So maybe after an afternoon of playtime in the park, you can curl up together with some snacks, and binge watch something dog-friendly on the tube. Sound good? How about a classic TV series? Might I suggest Gentle Ben? Samson once had a family of his own, but after losing their home, they were unable to care for him properly. He landed in a shelter, and was slowly losing his battle with the clock, when ARF stepped into to save him at the eleventh hour. Samson has such a pleasing personality, and he is instantly best friends with whomever steps into his yard and offers up a toy. He would be fantastic in a home with children, but he also needs to be with an experienced dog owner. Anytime you mention Samson’s name, any of the volunteers at ARF will automatically start smiling. He’s definitely one of the most popular dogs at our facility, and it’s easy to see why after spending some quality time with him. Samson is used to being kenneled at night, and even though he can easily entertain himself, we would love to see him in a forever home. 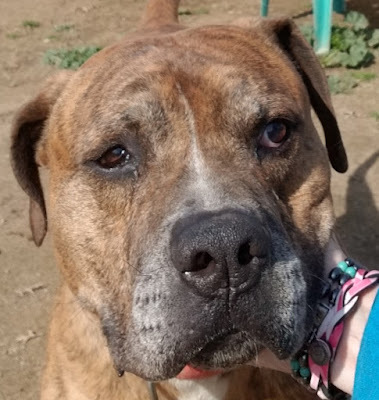 Samson is a Boxer/Mastiff mix, with a gorgeous brindle coat, and we estimate his age to be about nine years old. 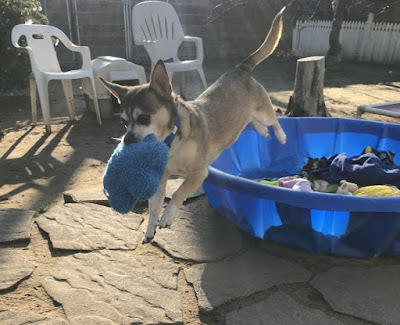 If you think you’re able to offer this tender ton of fun a house full of love and a yard full of toys, then come on out and meet the dog with a big grin and an even bigger heart. Oh, and don’t forget the Kong. If you prefer someone a bit smaller and a little more mellow, than Buddy Boy might be the one for you. This affectionate Terrier mix, with his wiry hair and fuzzy face, is one of the first dogs at the gate to meet you. He moseys right up for some attention, but never in a forceful way. His eyes are wise and knowing, and he seems to know if you’re having a bad day. 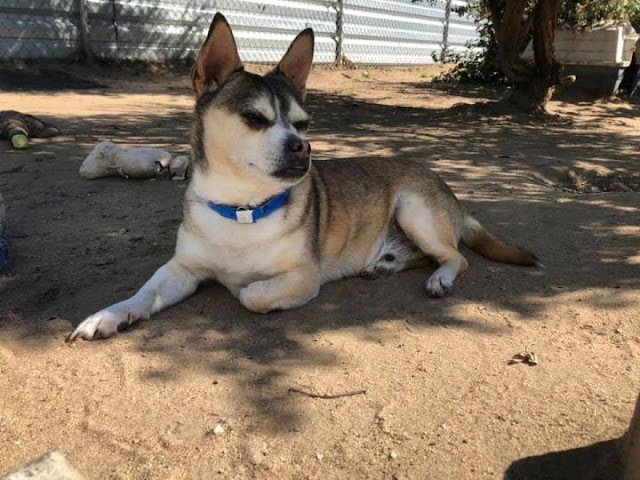 He plays with the other dogs, but most of the time, he’s happily dozing in a sun-filled spot in the yard, listening to all the other mutts as they run around and chase each other. Buddy Boy is one of those dogs who seems to get along with everyone, dogs and humans alike. He’s quite fond of going for walks, and is always thrilled when a volunteer comes to take him to see the great wide open. It’s funny how a lot of ARF dogs don’t like exploring the outside world, but because we don’t know a lot of their backgrounds, it can be understandable. A dog that has been loose on the streets, may not enjoy going back into that same territory. It’s clear that Buddy Boy had a home at some point because he does so well on his walks and strolling alongside whomever is leading him. So come out to ARF and meet him and see what a wonderful companion he could be. Whether riding to the dog park for fun and games, or hanging out on your sofa, Buddy Boy would be the perfect pal for your lifestyle. Just remember to bring along a lovely leash...maybe with a dog paw print pattern? Awesome! At ARF, we have so many amazing dogs to love. And love them, we do. One of the wonderful dogs I was going to write about in this article, was Daddio. He was a big ol’ hound dog mix, who just happened to be deaf. He barked and barked, and wanted everyone to know he was there. He was friendly and sweet, and didn’t have a mean bone in his body. Daddio passed away the same day I started to write this story. To him, we ARF volunteers want to say, we’ll see you on the other side. Safe travels across the Rainbow Bridge Daddio; you were loved. 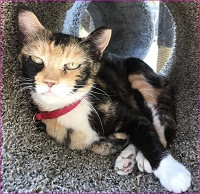 Animal Rescue of Fresno is located at 4545 E Dakota in Fresno, CA.